Easter occurs again on March 27, 2016. And we will soon be getting the March 2016 schedule information. I don't think there's ever been a year in the channel's history where they haven't shown EASTER PARADE to celebrate this holiday. ...And yes, it is back on TCM's schedule, Sunday March 27th at 8 p.m.
Tommy Tune tried out a staged version and it didn't work. I couldn't see how since most of the numbers took place on stage. I would have liked to have seen a staged version of Easter Parade. Maybe someday. Right-- it seems tailor made for the stage. Recently, I watched an episode of Nanny and the Professor, and Tommy Tune played a carnival barker. He didn't have many lines and was only in one scene. But apparently it was his first TV credit. In another thread recently, it was discussed that Ann Miller has never been a Star of the Month on TCM-- which seems quite surprising. EASTER PARADE and a batch of other musicals made during the golden age of Hollywood attest to Miller's star quality as a dancer and actress. Miller is similar to George Sanders in that the films that feature her best are the ones where she isn't the leading actress. That could be one of the reasons these two have never been SOTM. I respectfully disagree. You obviously haven't seen THE STRANGE AFFAIR OF UNCLE HARRY, because George is the lead in that Universal thriller and it's one of the best films made in 1945, possibly the top noir of '45. And TCM aired REVEILLE WITH BEVERLY this morning, in tribute to Frank Sinatra (who only has a four-minute musical scene in it), but it's clearly Ann's picture and she is on-screen 75% of the time. So these people did have opportunities to show off their considerable skills in lead roles. It's just that as TCM viewers we are so conditioned to seeing the Bette Davises and Clark Gables promoted as stars over everyone else. If anyone other than the usual suspects has half a chance at being recognized but their best starring roles fall outside the current TCM library, they're sunk (and so are their fans). Note I said similar and not 'the same' as it relates to Miller and George, but yes, I agree that George was the leading male star in some very good films during all stages of his career. This is one of the things that makes George unique; e.g. while many stars go from leading parts to supporting parts as they get older George went back and forth during his entire career. I haven't seen The Strange Affair of Uncle Harry but I would like to. My guess is that TCM doesn't feature this film because it is a Universal film. Note I said similar and not 'the same' as it relates to Miller and George, but yes, I agree that George was the leading male star in some very good films during all stages of his career. This is one of the things that makes George unique; e.g. while many stars go from leading parts to supporting parts as they get older George when back and forth during his entire career. Yes, unless it fits a special theme (like Eddie Muller's noir-programming), there is not much chance of seeing THE STRANGE AFFAIR OF UNCLE HARRY on TCM. It would be very nice if TCM, which usually does get films from Sony, could build a SOTM tribute for Ann Miller. Most of her earlier starring vehicles were at Columbia before she went to MGM as a second lead and specialty performer in musicals. I'd like to think the TCM programmers were reading this thread and its recent posts. EASTER PARADE is on the schedule in April for the Judy Garland monthly tribute...and...there is an entire daytime line-up of Ann Miller films, including some of her rarely seen Columbia programmers from the 1940s. I'm interested in Ann's early work. e.g. I watched Stage Door when it was on TCM last week. While I have seen the film many times I kind of forgot the character Ann played in the film; a kind of dorky, not that attractive gal (as compared to the Ginger Rogers character). Later on in the 40s she played a gal that men were interested in. Interesting comments, James. She matured/blossomed (whatever word you want to use) quickly. Of the Columbia titles, probably EVE KNEW HER APPLES plays on TCM most often. About two years ago, someone gave me a copy of THE THRILL OF BRAZIL. It had been recorded off TCM, and considering the older looking TCM logo (which has evolved) and Bob's set (which has also evolved) my guess is that it was a copy recorded in the late 90s/early 2000s. In the intro, Osborne said it was a premiere and that they had been trying for quite awhile to show it on TCM. And honestly, it's hardly aired since then. So seeing it broadcast again in April is a treat. It wasn't often that Harry Cohn made musicals in Technicolor during the 1940s. And from what I've read, it's because of Ann Miller's performance in THE THRILL OF BRAZIL that MGM decided to sign her for their Technicolor musicals-- which of course led her to being cast in EASTER PARADE. Easter is next weekend, which means EASTER PARADE will be airing on Sunday, the 27th. It's also being repeated the following month for the Judy Garland Star of the Month extravaganza-- on April 22nd. I watch it every year, but something different seems to catch my attention each time. This time I was very aware of what a good job lip-synching Fred Astaire did. I wonder if it's because, as a dancer, he was so used to repeating routines precisely and applied that same precision to his recreation of the vocal track. Sometimes even excellent singers have trouble with lip-synching, but it seemed so natural with Fred. Dougie, what you had to say was very interesting, and I agree completely about Astiare's lip-synching. 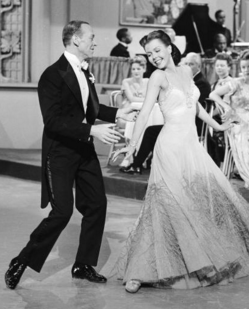 However, every time I watch this, I notice that at the end of one of the routines with Garland and Astaire that Judy stops mouthing the final word to the song way before the voice on the recording stops. I'm surprised that no one at MGM noticed that when they were editing. Have you noticed this with his other MGM musicals? Or mostly with his performance in EASTER PARADE..? Fred always prerecorded his singing...and his tap dancing. I think his impeccable lip-syncing ability may be contributed to his insane sense of timing as an accomplished drummer. Although he started playing piano, accordion, and clarinet at a very early age, his passion was always the drums, as evidenced in films such as "Lady in Distress", "Easter Parade", Daddy Long-Legs", to name a few. Just my opinion of course. Thanks for the photo of Ann Miller. I have been in love with her since a little boy. Everyone raves about Eleanor Powell being the best female tap dancer of all time but my vote goes to Ann in the categories of ability and beauty. My hobby is taking old photos of actresses from the 20s to the 60s, repairing, cleaning, resizing, and turning them into full color. I have accumulated about 78,000 photos...600 of just Ann Miller. You're welcome..and thanks for sharing your pics of Ann. Sounds like a fun hobby! Speaking of Ann Miller for a second, something I discovered is that she was only 14 years old when she appeared in the 1937 movie "Stage Door." She certainly held her own tap dancing and wisecracking with Ginger Rogers, Eve Arden, and Kate Hepburn. I didn't know that. In another post I made a comment that in Stage Door there is the scene with Ann and Ginger and Ann plays a girl that the slimy producer played by Menjou ignores while he goes out of his way to get the attention of Ginger. It was like Ann was cast as the ugly duckling; the gal no one would be interested in. But since she was 14 maybe that scene was shot that way due to her age??? I just read that Ann lied to MGM and they believed she was 18. I wonder if that really was the case. The fact she was only 14 (barely) when she did Stage Door is quite true and can be verified by the U.S. Census Bureau. According to the 1930 Census, Johnnie Lucille Ann Collier (aka Ann Miller) was 7 years old and Stage Door being made in 1937 would put her at the ripe old age of 14. LOL She was always tall for her age and, as witnessed in Stage Door, well "developed" for a child of 14. You misunderstood. I questioned if no one in management at MGM really didn't know. Because as you note it wouldn't be that difficult to confirm her age. So maybe the folks in charge at MGM just decided to sign her and 'look the other way'. Either way Ann was a major talent. But since she was 14 maybe that scene was shot that way due to her age??? I just read that Ann lied to MGM and they believed she was 18. I wonder if that really was the case. BTW-- Stage Door is a 1937 RKO movie. Just look around and see Katharine Hepburn and Ginger Rogers in the mid-1930s and you should know you're not at MGM. Ann Miller signed with Metro in 1948.